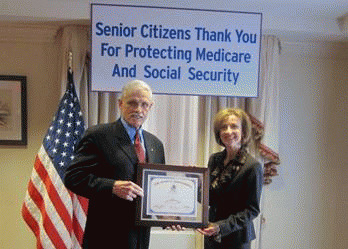 Nan Hayworth's office sent out a press release Thursday that included a picture of the NY Congresswoman receiving an award beneath a sign saying, "Senior Citizens Thank You For Protecting Medicare and Social Security." It appeared to be a perfect photo opportunity for Hayworth, being honored by a group known as the "60 Plus Association" for legislating in their best interests. But there are two big problems with this picture. First, Nan Hayworth just voted to kill Medicare, if you're one of the very few that has forgotten. And second,the 60 Plus Association is not a senior citizen's group at all, it's a pharmaceutical industry astroturf flim-flam. This is a crass attempt by Hayworth to once again deceive her constituents, particularly the elderly. Back in 2003, the AARP Bulletin recognized 60 Plus as a front group for Big Pharma. The publication claimed that the organization wasn't even receiving membership dues from seniors at the time and that "virtually all of their largest contributions in recent years have come from the same source--the nation's pharmaceutical industry." The Bulletin revealed that 60 Plus was well funded by the Pharmaceutical Research and Manufacturers of America (PhRMA), Citizens for Better Medicare, and four pharmaceutical companies, Hanwha International, Merck, Pfizer, and Wyeth-Ayerst. Currently, as a 501(c)(4) tax-exempt organization may legally accept corporate donations, but is not required to disclose its funding sources, which it doesn't. 60 Plus has also been a favorite cause in among Beltway conservatives. Lobbyist, Republican operative, and convicted felon Jack Abramoff once instructed an Indian tribes he represented to contribute to 60 Plus. Abramoff told the tribe that a donation would help it get support among GOP leadership for its legislative causes. Since its inception, the 60 Plus Association has had the back of Big Pharma, helping the industry with mass mailings, press releases, and lobbying efforts. It was one of three industry-backed associations that backed the infamous "astroturf" issue ads of Citizens for Better Medicare (another drug industry front group) during the 2000 elections. Also notable was 60 Plus's support of lawsuit by PhRMA against the state of Maine, in their issuance of a "friend of the court" brief. PhRMA sued to stop the State from implementing Maine Rx, a law that reduces prices for Medicare drugs by enabling the state to offer discounted prescription drugs to the working poor and elderly through bulk purchases from manufacturers. The trial ultimately went to the Supreme Court, which eventually allowed Maine to implement the trail-blazing program. Not to be dissuaded, in 2002 the organization fought legislation in several states that would create lists of preferred, low-cost prescription drugs for Medicaid patients. 60 Plus did this with assistance from the lobbyist group Bonner & Associates, which specializes in facilitating astroturf organizations. Voters were targeted by Bonner's phone marketers who identified themselves as activists for 60 Plus. They asked those they called to tell their legislators and governors to defeat Medicaid reform legislation. It was later revealed that pharmaceutical giant Pfizer had paid for this calling campaign, an allegation the industry giant later admitted. 60 Plus President James L. Martin, however, denied anyone was ever misled. Also in 2002, 60 Plus paid for issue ads on local radio and TV stations across the country saying that local Republican candidates "care for seniors" so much that they "passed a prescription drug bill" that "saved us from an inept government bureaucracy meddling with health plan benefits." But in 1999, 60 Plus actually fought against these Medicare reforms, even referring to the Clinton Administration's prescription drug benefit for seniors to be "socialized medicine." 60 Plus' Roger Zion warned the National Journal that the "prescription drug benefit would cripple pharmaceutical research and ultimately undermine the quality of health care in the United States." Of course, this program never crippled pharmaceutical research. During the Health Care Reform debate of 2009, 60 Plus aired television commercials claiming that the Obama administration planned to fund healthcare reform on the "backs of seniors." The commercial made the following claims among others: "Congress plans to cut 500 Billion from Medicare," "seniors May Lose Their Own Doctors," and "the Government, Not Doctors Will Decide if Older Patients are Worth the Cost." The commercials ended by saying "Tell Congress, Don't pay for Health Care Reform on the backs of Our Seniors. They've sacrificed enough." The ads clearly state "Paid for by 60 Plus Association" and display the www.60Plus.org website at the end. In Thursday's photo-op of Hayworth, she is being handed a plaque by Martin, still President of the "non-partisan" 60 Plus. And Martin's own partisan political involvement over the years makes the image even more Orwellian. Martin served as the Chief of Staff of the late Republican Senator Edward J. Gurney in the late 1960s has a long service record as a Republican operative since, even claiming to have given George W. Bush "his first political job"way back in 1967." And according to his authorized biography, Martin also "helped to organize and direct several advocacy groups including the National Conservative Political Action Committee," which pioneered independently produced political attack ads. Martin also credits himself with coming up with the phrase "death tax," as part of efforts to repeal the estate tax. Oddly, 60 Plus's national spokesperson is none other than white-bread crooner and hate-monger Pat Boone, an unfortunate choice for a group that calls itself "non-partisan." Boone recently wrote on World Net Daily that liberalism is like a cancer-causing virus and he often harps that he doubts the authenticity of President Obama's birth certificate. It's sad to note that Hayworth and 60 Plus had to manufacture an award. Because Hayworth may not be winning over many voters in her district--especially senior citizens--it's an obvious attempt to mitigate backlash against Republican freshmen scrambling to cover over their callous disregard for the health and welfare of the elderly. Follow the Congresswoman's curious Congressional career on "Where's Nan Hayworth?" on Facebook.